What Is an Organizational Chart Template? 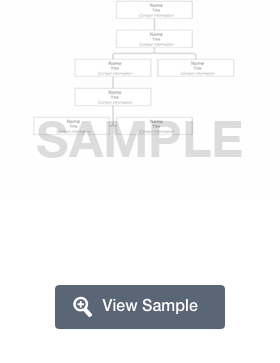 An organizational chart template is a form you can complete to document an organizational structure. That is, how individuals fit into a large organization. Of course, it can be used with a small organization, too. However, it is highly beneficial for larger organizations. Also known as a company organizational chart, an organizational chart template provides you with a visual look at who is part of the organization and what they do. While there are standard ways to create and maintain this sort of document (such as creating and maintaining it in Excel, PowerPoint, or Microsoft Word; you could also invest in chart software), you can edit the document in a way that works best for your needs. A business may have more than one organizational chart. There may be one for the entire company. There may also be smaller charts for different departments that denote the structure of a team or department. The chart structure ultimately depends on how the chart will be used. Although businesses are the main users of this sort of document, it can also be used by a non-profit, a school, a club, a sports team, or any other group or organization that has a structure to it. Later on this page, you'll read about some organizational chart examples. Creating org charts works well because it provides a visual look at the structure of a company. It may also include internal company extensions or cell phone numbers to make contacting members of the organization easier. This document is extremely helpful for new employees because they can get to know who works for the business and in what capacity. It’s helpful for managers because they have contact information for members of their department at the tip of their fingers. It can also provide managers with a broad overview of everyone in their department. That is incredibly helpful particularly if new positions were recently created within large corporations. If someone is on vacation, moves to another company, or is part of an inter-department transfer, it can help managers determine which tasks must be reassigned. Create a free Organizational Chart in minutes with our professional document builder. Whether you need an organization chart template depends, ultimately, on your business. If you run a large business, you may find that having one makes corporate life easier. In fact, you may want one for the entire company and then one for each department, such as customer service. Smaller businesses may not need one, but they may still find it helpful because it provides a glimpse at the set-up of the company. What Are Some Reasons to Use a Free Organizational Chart? You can use it to build your company structure in a way that meets the objective of your business. Employees can see and understand the structure of the company. For example, consider the marketing department. The top level would be the manager or director of the department. Under this person, would be the first line of people that report to them. An example would be team leaders. For each leader, you would list the individuals who report to them. You can use the chart to also track the functions or duties of each department. You can see every member of the organization or arrange it to only show key employees. If you list the responsibilities of each member of your organization, you can determine how duties are distributed and whether any particular person has too much work or not enough work. It creates a visual chain of command. It can be used to analyze the way each department works so that you can generate specific reports. Since most people think that a sample organizational chart can only show a chain of command, let’s briefly discuss how the document can be used to evaluate the way that a company operates. First, why would you want to evaluate how your business operates? The simple answer is to improve efficiency. This could be the overall efficiency of your business or for one or more departments. You can also determine if there are any skill or duty gaps. You will also be able to see whether you have any employees within the business can fill those gaps, even if only temporarily. As mentioned earlier, you can also see how work is distributed. Then, you’re better able to redistribute the work if necessary, outsource certain tasks, or hire more staff. Now, let’s examine how this org chart template can help you restructure. Restructuring isn’t just something a business does when it isn’t doing well. It is also something that you can do when business is going well. Restructuring when the business is doing well is more about continued or improved efficiency. You can see which positions best advance your company. What are those positions doing that contribute so much? Is there a way for you to make work life easier for those key individuals? Do you need to bring in additional help to continue to grow? If you need to bring additional help, will you need to hire or promote an existing staff member to the position of a manager? And, if you promote, will you need to hire someone to take over their previous responsibilities? An org chart template presents information in a visual way. Sometimes, though, it’s not the best choice. For example, you wouldn’t want to use one for budgets or all day-to-day operations because it is more about a broad overview and doesn’t necessarily include all of the details you need to make certain decisions. You shouldn’t use one if you’re business uses a lot of temporary workers that come in and out of the business. This could make the org chart template hard for you to keep updated. Instead, you’d want to create a different document that tracks the current temporary workers, what they do, how to contact them, and when they leave the company. If you have a large business, you may find it cumbersome to create a single chart. If you tried to track every department and every employee, the chart could become unwieldy and hard to manage and update. You could still use a chart, but you’d have to change the information that you put on it. Maybe you only list department heads. Maybe you have a chart with department heads and then each department head creates a smaller chart that lists each person that reports to them. If team leaders have big teams, they may benefit from creating their own. Organizational charts aren’t just relegated to one specific set-up. Here are the most common types and their key features. Remember, using a template is about making the creation and management process for this document easier. You can choose which components to use, and you don’t have to bother using the ones that don’t work well for your needs as a business. A hierarchical org chart is one of the most commonly used types. It shows relationships based on a hierarchy. It can be used to track the hierarchical organization of a company, a department, a team, or another group. A common use is a school organizational chart. If a school is shutting down for a snow day, the person at the top of the list would call the people directly under them. Those people would then call the people directly under them. This helps ensure that everyone is aware that school is not being held because of the impending snow storm. It can also be used to help individuals understand to whom they report. Most businesses have a chain of command. If you had a problem with another work, you’re supposed to go to your direct command. The chart would show you who that is. Of course, if that’s the person you’re struggling with, you’d go to the person above them on the chart. Regardless of how a hierarchical org chart it is used in the long run, it’s an important document for both new and long-term employees. It helps both become familiar with who plays what role within the organization and how they would contact those people if necessary. You would use a matrix organizational structure if an employee may report to more than one supervisor or manager. This chart is used when a business has reporting relationships that can or do change. For example, if you have a graphic designer, they may move from project to project. On Project A they report to Sue Doe. On Project B they report to John Smith. When they move to Project C they report to Linda Brown. So, this chart gives a business a way to track projects and how the reporting structure changes. If your organization is more processed focused, then you may find a horizontal org chart to be more beneficial. It shows the flow of work that takes place for a specific product or service as it moves through the entire process. This can be used to do more than just outline how the workflow occurs. It can also be used to find areas where your business can improve that workflow. One drawback to this chart is that you’d want to create a horizontal chart for each service or product that your company provides. A blank org chart is an template that allows you to input your company’s information directly into the template in the way that you feel is best. You could create one for key employees that explains their reporting structure, name of their position, and phone number. You could create one for each department. A blank org chart gives you the freedom to create a chart that works well for your business. A flat org chart is used for a flat organization, which is another name for a horizontal organization. Generally, there are few or no levels of middle management that exist between executive staff and team members. So, if you have five people who report to the Vice President of Marketing and two people that report to the Vice President of Sales, you’d use a flat chart because there aren’t middle managers that would be inserted. An HR org chart is a chart that is used to keep track of the team members who are part of the Human Resources department. It may include the Administrator, each department, individuals who are part of each department, and contact information. This can help team members know how the HR department is structured and to whom they should speak with about specific issues. This is a chart that shows the way that a company is structured. Of course, how the chart is set up may depend on the type of business you’re running, its size, and the processes and procedures of the business. A restaurant org chart is used by a restaurant. It may start with the owners of the restaurant and list those who report directly to the owner (such as the accountant and the general manager). Next, it would list who reports to the general manager (such as assistant managers and the kitchen manager). Then, it would list which staff members report to the assistant managers. It would also list which staff members report directly to the kitchen manager. A partnership org chart outlines how a partnership operates. It will list the type of partnership, the names of the partners, and the positions that report to each position. A business org chart is used to outline the structure of a business. It may start with the CEO and list a side branch that shows their executive assistant. It will also list each executive that reports to them. Each of the executives will have branches that show who reports to them or the products or services they are responsible for overseeing. From there, the chart may list departmental managers or leads. A project org chart outlines how each project is supposed to proceed. It can list senior management, each position or committee involved, and who reports to each of those positions. For example, a systems administrator may report to the project manager. A hardware engineer may report to the systems administration. The web designer and a documentation specialist or technical writer may report directly to the project manager. A hotel org chart documents the structure of the hotel staff that takes care of guests and ensures smooth operation of the business. These charts can be quite complex depending on the size of the hotel. It may start with the hierarchy of who reports to the general manager. The bottom level of that hierarchy may be the Deputy Assistant Manager who oversees the managers of various departments, including finances, front desk, HR, food, and sales. Then, for every manager that reports to the Deputy Assistant Manager, you’ll list the positions that report to that specific manager. A travel agency org chart creates a visual aid that depicts how a travel agency is structured. It may start with the manager. Next, you’d list the departments that report to the manager (such as sales, operations, and administration). Then, you’d list the individuals who report directly to the managers of those departments. For example, account executives would report to the sales manager. Travel agents and customer care reps may report to the operations manager. The accountant, accounts receivable, and other personnel may report directly to the administration manager. A factory org chart outlines how a factory is structured. It can be based on departments or on the processes involved in creating one or more products. For how a factory is ran, it starts with the factory manager. Then, you’d list the departments that report to the managing director. You could also list the production phases and which planning and production units are involved as well as the administrative side of the business. An event org chart outlines how an event will occur. It generally starts by listing the event director. Then, it lists the venue coordinator, equipment coordinator, food coordinator, and the program coordinator. Then, under each coordinator, you’d list the responsibilities of each person. For example, the venue coordinator would be responsible for booking the venue, the setup, creating and using signs, taking care of the location, and analyzing and preparing for associated risks. A church org chart outlines how a church is operated. At the top of the chart is the pastor. The individuals who report to the pastor would be listed next (for example, deacons, deaconesses, and ministers. Then, you’d list who reports to each of those positions. For example, the youth department may be overseen by a youth minister. The nursery may be overseen by a women’s ministry or a parent’s ministry. A music minister may oversee the various choirs or music teams. Make sure that you properly use colors and other design elements. Your chart must be easy to read and understand. Stick with tan, easy to read light yellows, and light blues. You should use an easy to read font that is at least 10 points in size. You want the font large enough for people to be able to easily read the information. Don’t use cursive style fonts. Stick something professional and easy to read like Times New Roman, Courier, Arial, or Garamond. Consider using colors only to highlight key positions, such as the CEO or managerial roles. Don’t use too much color or too many colors. Consider color coding positions. For example, all middle managers are denoted by a box that is tan and all department managers are denoted by a light blue box. Make sure that you review your chart for errors. You should also make sure that you revise the chart on a regular basis. Ensure that you have the proper contact information or extensions for each key member listed. Your chart should fit on a single page. So, if you have a large organization, you may want to use legal sized paper. You may also want to make more than one chart if yours exceeds one page. Consider how you’re going to print the chart. It’s generally best to print your chart as landscape. Think about the look of your chart. Is it easy to read? Is it too crowded? Do you need to change some of the components to make it look or read better? Choose and use a consistent design. All of your boxes should be the same size unless the box lists more than one person. For example, if you have a box that is titled “Middle Management” and it lists four people, it will be a different size than a box that lists only one or two people. Remember to include any assistants or administrative staff with their managers as a sidebar. Double check that you’ve listed the titles of individuals before any names. Most people may look to locate a specific position and not a name. Would your company benefit from a PDF version that they can access from an internal drive?